Do you think Spinosaurus walked on 4 legs, 2 legs, or both? I'd say both, like this. Both. Although it likely spent most of its life in water. What's the case against Achelosaurus being a different species of Pachyrhinosaurus? The undisputed dominant predator of Jurassic Mainframe. If you're concerned about where this franchise is headed, then please join us. Walking quadrupedally wouldn't happen, it would have to deviate crazily from the condition seen in all other theropod species in order to be able to do that. 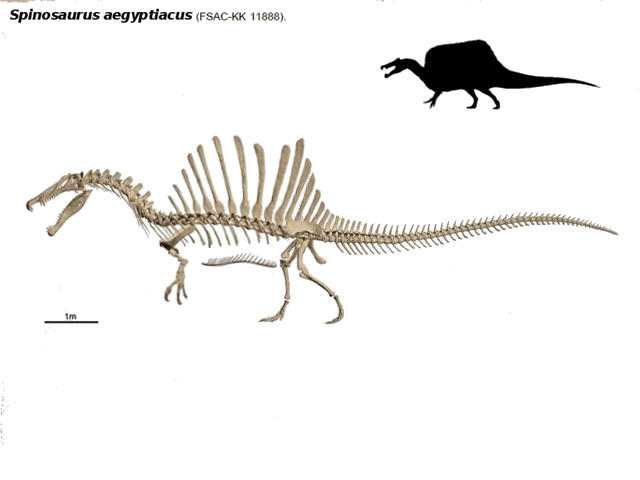 We lack enough evidence of the arms of Spinosaurus to say that they were any different from those of other Spinosaurids. Even the purporters if the quadrupedal model themselves have backed down from it, I hear. @Achelousaurus, aside from physical differences like the boss and frill shape, it appears that Achelou lived earlier. My grandmother dropkicked a fish. Do we have any Taurovenator's size estimates? 20 feet / 6 meters long, same as Aoniraptor. I've also heard 7 meters. 6 meters...Pretty small compared to the others XD. But still great. Thanks Oliphaunt. any help on my questions? Requiescas in pace, Jurassic Park Legacy. We will never forget you. Rplegacy: Pursue all ambition, ye who enter here! @Oshronosaurus: It would probably be Yudryptos, as the unaltered Latin word is dryptō (δρύπτω). you wouldn't happen to have any links to papers describing Eoraptor, would you? So has the theory of the spinosaur's sail being a hump been debunked? I haven't seen paleoart of it in a while. @Osh, nope, sorry. Closest I got is the description of a herrerasaurid from 2010-11. @RaptorLover0823, Ibrahim et al. (2014) concluded that the top 1/3rd of the spine was tightly covered in skin and didn't support a hump. It's more likely that it was a hump at the base, a ridge at the middle and a sail at the top. Is Tianzhenosaurus still considered it's own ankylosaur or is it a far more complete specimen of Shanxia? Still mostly considered its own genus. Mostly. Why did the lambeosaurine get rarer as the Late Cretaceous went on? We have a bunch of Lambeosaurines from 70-66 mya, IIRC. From what I've seen and read, only Hypacrosaurus was the one to have lasted until the bitter end and it's habitat was limited compared to Edmontosaurus. So there are at least 8 species of lambeosaurines that survived until the K-Pg (source: Wikipedia). Wow, I didn't know that many survived. I've heard of Hypacrosaurus, Charonosaurus, and Ororotitan, and the unidentified HC one, but not the others. Thanks. Not to mention that it seems like they were doing better in Asia than in N.A. at the time (more on that will likely be forthcoming but that was talked about at International Convention on Vertebrate Morphology). It seems that even looking back further into the Cretaceous that there was always a disparity in the niche of lambeosaurines and saurolophines which can be seen as far back as the Dinosaur Park Formation. What were those reasons? The climate and plant life in North America looks and seems reasonable enough to support a nice population of lambeosaurines to me. It itsn't fully understood, but there seems to be a trend (at least in the Dinosaur Park & time equivalent formations) that Albertosaurines, Lambeosaurines, and Centrosaurines being found further north than Tyranosaurines, Saurolophines, and Chasmosaurines being found further south. As the Cretaceous moved on, the southward families moved northward, and the Lambeosaurines became more rare, with the Albertosaurines going extinct and the Centrosaurines being restricted to asia. This probably relates to ecological preferences, and climactic changes caused a loss in the preferred Northern habitat (perhaps in relation to the closing of the Western Interior Seaway but that is anecdotal at best). Is it possible that the Tyrannosaurines, Saurolophines, and the Chasmosaurines were better parents and had a higher reproductive rate then the Albertosaurines (provided that Nanotyrannus really is a juvenile T. rex and not an Albertosaurine), Lambeosaurines, and Centrosaurines? It's possible but there isn't any evidence for it either way. It's more likely that changing environments are what allowed one group to survive over the other. Why did the amount of nodosaur species dwindle as the Cretaceous went on and why was Edmotonia so common despite that? I read that nodosaurs had a more picky diet, but that doesn't explain why Edmontonia was so common and had such a wide range from as far south as New Mexico and probably Texas to as up North as Canada and maybe Alaska. Competition with Ankylosaurids maybe? From what i've seen they started to diversify at the end of the early cretaceous. Perhaps they managed to take advantage of a food source that they couldn't and were able to out-compete them for resources, or had better defenses to protect themselves and their young. If their clubs really were used for defense but idk if there's reliable data on that. As for why Edmontonia was so common, my best guess is that they evolved to share their environment with their competition, there seem to be other Nodosaurids and Ankylosaurs wherever they're found, so perhaps they were doing their own thing. Could ankylosaurs and nodosaurs gallop in spite of their armor? Unlikely because they had very short, stubby legs and very long, wide, and (relatively) inflexible torsos. Could Deinocheirus and Gigantoraptor use their hand claws for defense like the theriznosaurs did? I've got no doubt that if they did have to fight, they'd probably use their claws to some degree, but as to how effective they'd be as weapons i don't know. In Deinocheirus's case i'd say it would use its body weight a bit a more and rely on intimidation. Most predators would be deterred by their sheer size. But most animals will try anything when it comes to a fight as long as they can do some damage. How do you rate Fallen Kingdom? » Klingons and Vulcans and Starships. Oh my! The Star Trek thread. » "Dinosaur Protection Group" Twitter/website is online! » If I Twitch stream this game, would you watch?